The benefits of the blockchain technology for logistics and supply chain become obvious once we think of blockchain as a network where each record can be traced back to its origin. With blockchain, all documentation that usually accompanies a product from its manufacturer to the end customer – certificates of origin, waybills, insurance policies, quarantine and veterinary certificates, invoices, what not – is aligned into a neat chain where each new entry is easily visible. With blockchain, the problems of lost or incorrectly issued documents, different formats, and – this is especially important – handing documents and products over between the members of the logistics chain, are reduced to the minimum. One of the inherent advantages of blockchain – the immutability of records – is what makes it so effective for logistics. In the pharmaceutical industry, blockchainâ€™s ability to provide an immutable database is especially beneficial, as it may help to reduce or prevent drug counterfeiting. This problem has gained global importance and is getting the attention of different regulatory organizations. Drug counterfeiting costs us millions of dollars each year. However, its real danger is that it also costs human lives that are lost for taking fake medicine. According to WHO, counterfeit drugs are found in various therapeutic areas and at all price levels – from generic medicines to innovational cancer treatment products. While WHO recommends staying alert and paying attention to the properties of the medicines, such as the package quality, batch numbers, expiry dates, logos, security seals, etc. However, counterfeiters are becoming increasingly skillful and produce medicines that look, feel, and smell like genuine ones, and you never know whether the active substance is present at all. When the pharmaceutical logistics is running on blockchain, switching a genuine medicine for a fake one becomes next to impossible. With blockchain, it is not enough to prepare important-looking papers to â€œproveâ€ the origin of the drug. With blockchain, the criminals will need to modify all records in the chain up to the very first one, and blockchain prevents such modifications by its nature. Another problem that can be resolved by the implementation of blockchain is the intellectual property issue. Pharma companies spend years of research and millions of dollars to create advanced drugs and, naturally, they want to protect their inventions. Blockchain with its immutable databases can make intellectual property rights protection much more straightforward, as the ownership can be traced back to the very origin. What is especially exciting is that the use of blockchain in the pharmaceutical industry is not a thing of the future or a bold prediction. Today, pharma companies already partner up with blockchain developers to build networks that can take their operation to a new level. There are a number of interesting projects in this area that are worth examining in greater detail. It is a fact that the blockchain technology is seriously considered by large pharmaceutical companies with a global presence. They regard it as a platform that can resolve their major challenges, ensure drug authenticity and help to bring new medicines to patients quicker. Some of the most prominent blockchain projects in the pharma supply chain illustrate the most important use cases where the industry can benefit from this technology. 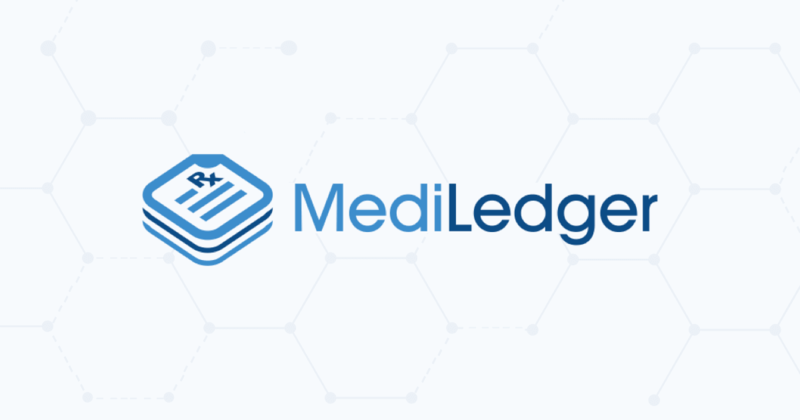 The MediLedger project was launched in response to the track and trace regulations requiring all participants of the pharmaceutical supply chain to implement electronic systems of tracking and verification of medical products and their transactions. These regulations were developed in an attempt to reduce drug counterfeiting and ensuring the authenticity of medicines on the market. MediLedger is a blockchain-based network designed for the primary purpose of tracing the change of ownership of drugs. The project that is now at the commercial launch stage is supported by a number of pharmaceutical manufacturers and wholesalers, including such brands and Pfizer and Gilead. The aim of MediLedger is to create a network recording every transaction that occurred to a drug at each stage – from the manufacturers to suppliers and end customers. The project is designed as a permissioned Ethereum blockchain joining trusted pharma companies, service providers, and wholesalers. MediLedger invites other companies in the industry or service providers to join the network, however, guarantees their privacy and confidentiality within. The permissioned blockchain that is at the core of MediLedger allows each participant to decide which data they are willing to share with others and which to keep confidential. This way, despite the decentralized nature of the network, each partner can keep their trade secrets and protect their intellectual property. Currently MediLedger is implementing the first of its drug tracking solutions – saleable returns. The solution is designed as a means of verifying the authenticity of drugs unsold by retailers and returned to wholesalers. When such drugs are still within their expiration period and undamaged, they can be put back into the commercial network, but the wholesaler needs to verify that what they received from their partners is genuine. The blockchain network will enable such verification. From private projects, letâ€™s proceed to public-private programs. 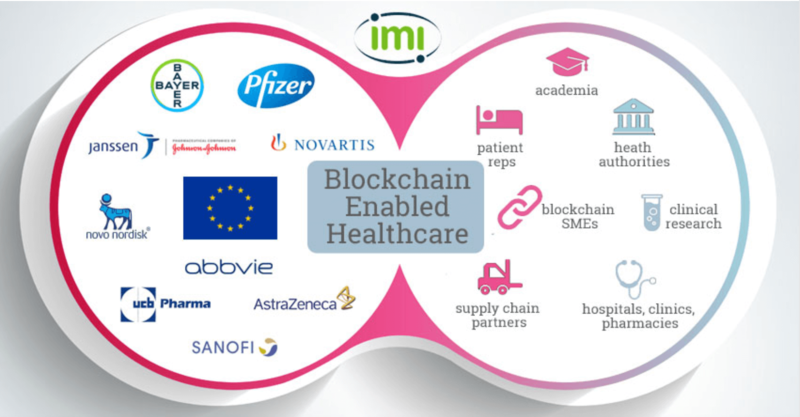 The Innovative Medicines Initiative (IMI) which represents a partnership of the European Union and the European pharmaceutical industry, announced a grant challenge for the financing of a blockchain healthcare project. The program which is supported by major healthcare companies, such as Bayer, Novartis, Sanofi, and other equally known brands, involves the creation of a blockchain ecosystem covering all aspects of drug manufacture and distribution. In an attempt to fight drug counterfeiting, provide access to medicines and medical data, and protect the pharma companiesâ€™ intellectual property, the IMI invites applicants to present their proposals of such a blockchain platform implementation. As the result of this project, the IMI expects to develop a comprehensive blockchain system supporting medical research, analysis and trials, drug manufacturing and distribution, and access to the medical information both for patients and researchers. The estimated benefits include reduced costs for the participating healthcare companies, automation of various processes, security of patientsâ€™ data, transparency of the supply chain. For the pharmaceutical companies, the project is going to provide the common standards that the drug manufacturers should adhere to. This way, the companies will ensure compliance with the adopted regulations. At the same time, blockchain will guarantee the authenticity of all medicines recorded in it and prevent fraud. According to the IMI, the project is launched as a long-term initiative with the winner obtaining investments in their research programs and assistance in the adoption of their solutions. What is interesting about this project is that it is a pharmaceutical supply chain solution that is being developed by non-pharmaceutical companies. In fact, the project scope is wider than that, but the pharma supply chain is one of the prototypes that is being created. In this project, DHL, a global logistics giant, and Accenture, a well-known technology provider, joined forces to create a blockchain logistics platform. Besides pharmaceuticals, their solution is intended to serve the whole logistics sector, but the pharma industry was chosen as the prototype for its especially high requirements. DHL and Accenture are building a blockchain network where drug authenticity can be verified and traced back to the origin. Their solution is going to include drug manufacturers, distributors, logistics companies, warehouses, retailers, hospitals. At each stage, any medicine can be verified for genuineness. Moreover, the proposed solution is going to ensure the drug safety along the entire journey from the manufacturer to the patient. Of course, with blockchain, the costs of logistics are going to be lower than with traditional practices, while the quality may be even higher. The documentation and organization of the entire process will become more streamlined and less prone to errors. Take a look at out last artile “5 cases how blockchain can cut costs of your business“. When speaking about blockchain, the future is always much closer than we think. The technology evolves literally in leaps and bounds with new solutions and mechanisms appearing all the time. The projects we described above show that blockchain has long exceeded its common notion of a â€œtoy for geeksâ€. Moreover, we see that it is no longer a platform purely for crypto mining. More and more often, we see names of global brands in the blockchain context. Now, we even see that such international institutions as the European Union are getting interested in blockchain and ready to finance its development. On a large scale, this trend means that the great disruption by blockchain is just around the corner. Those who jump on this wagon are going to end up better suited than their more conservative competitors. However, this trend has another side, and that is the growing demand for professional blockchain development. While there are many blockchain development companies and their number is growing, the price of blockchain development is growing as well. Thatâ€™s a normal market behavior, and we have to live with it. At the same time, such price increase is most clearly visible in the US, while in Eastern Europe which is considered a great software outsourcing hub the prices remain at a moderate level. European developers have proved their expertise by delivering dozens of successful blockchain projects. Still, building a complex enterprise blockchain solution that is usually required for pharmaceutical companies is a task for experienced developers. Such projects involve a lot of research and analysis and their development should be of the top quality. We are proud to say that we have blockchain and cryptography experts on board and can design and develop distributed enterprise solutions in accordance with the high requirements of the pharmaceutical industry. If you need a reliable, efficient, secure and cost-effective blockchain product that will grow with your business, contact us for a consultation, and letâ€™s see what we can do together.